A man who is prepared to attack the closed-set model of Christianity, of them-us, in-out good-bad, saved-unsaved and present an open useful honest model of people moving either towards or away from the centre. There's stuff that is just so ahead of us, like the idea that to see the whole divine centre not just from our angle, we have to be in dialogue with those whose journey approaches the centre from other directions. The book begins by taking a serious look at the history of Christendom, the utter disregard for human rights, proven guilt of total destruction of tribal cultures, implicated in the worst cases of genocide. It's not pretty. Andrews is a man that in a small community in Brisbane has offered the most inspiring practical model and outworking of a truly inclusive church/community that I've encountered so far. One that deals with dirt and is prepared to live amongst it. It still inspires me now. Fred Abbot, Amazon Review, London, England. Charles Ringma, PhD, Professor, Regent College, Vancouver, Canada. 'This is a courageous and provocative study, likely to earn applause from some, and brickbats from others, but certain to challenge and to stimulate serious reflection. Patricia Harrison, PhD, Professor, Tabor College, Sydney, Australia. Brad Bailey, Senior Pastor, Westside Vineyard Fellowship, Santa Monica ,USA. The late Anglican Bishop Ralph Wicks used to say in the midst of his three hour Good Friday services that 'Christianity is not a religion, it is a relationship'. 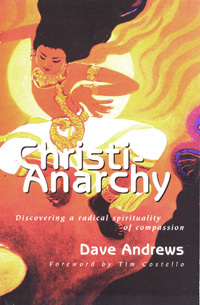 This is a hardy seed of an idea: an idea which has taken root in Dave Andrews' book Christi-Anarchy. In reviewing this book, I feel as though I'm introducing the man himself. Dave identifies strongly with his worldview, to say the least. He takes his religion very personally - in fact he is, to put it simply and I hope politely, fixated with Christ. This is the essence of the theme of Christi-Anarchy: that Christianity as a religion has been distorted by its neglect of the actual figure and teachings of Christ. This is hardly a new message, as there are many reformers who strive to reclaim the original and central personality of Christianity. But Dave is not trying to reform an ailing system. Like his political counterparts, the anarchists, he is trying to practise a new system within (or alongside) the shell of the old. Which explains, partly, Dave's capacity to irritate even the most sympathetic church bureaucrat. My only worry (apart from being a church bureaucrat myself) is that in trying to evangelise the evangelicals, liberate the liberals and ferment the fundamentalists, Dave risks trying to 'out-Jesus' Jesus. There is a thin line between devout disciple and messianic mischief-maker. For what it's worth, I can vouch for Dave's presence on the right side of this line. More importantly, however, so can hundreds (if not thousands) of people from the slums of India to the boarding houses of Brisbane - in other words, the experts on such matters in the Upside-Down Kingdom. Dave lives a Gospel story in friendship with his Lord through the gift of community. He is an open-minded absolutist who errs on the side of compassion in any situation, based upon an informed imagination of where Christ is in today's world. Dave's other genius is that he upholds deep-seated tolerance while adhering to a central claim of Truth. Gleaned from years of service in the multi-religious and caste-based society of India, Dave has a firm grasp of pluralism and how its neglect has (at times inadvertently) turned many Christians into racial supremacists, on the one hand, and other-worldly quietists, on the other. Dave also knows what buttons religion pushes in the Australian psyche. 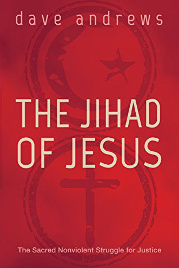 He has obviously argued with evangelicals and liberal Christians alike, challenging each with the unique counter-characteristics of Jesus. The final synthesis of this argument is a discomforting and compassionate faith which maintains open boundaries around a central (and hard) core of belief. Dave writes out of his current experience in innercity Brisbane within 'the Waiters Union', a network of creative community workers who have befriended local refugees of all kinds - from persecution, society, the church and the dominant consumer culture. I found Christi-Anarchy engaging, perceptive and provocative. It includes some meaty sources, for those wanting to devour further, from a smorgasbord of writers, activists and radical movements. More importantly, it provides the basis for practical action by local Christian groups, as well as those who have been stung, bitten or crushed by the institutional excesses of the faith. This is a truly offensive book and the writer should be commended. Jarrod McKenna, PeaceTree Community, Perth, Australia. Jyotsna, Amazon Review, Rajasthan. India.